Over the last decade or so, private-sector financing through public-private partnerships (PPPs) has become increasingly popular around the world as a way of procuring and maintaining public-sector infrastructure, in sectors such as transportation (roads, bridges, tunnels, railways, ports, airports), social infrastructure (hospitals, schools, prisons, social housing) public utilities (water supply, waste water treatment, waste disposal), government offices and other accommodation, and other specialised services (communications networks or defence equipment). This book, based on the author's practical experience on the public- and private-sector sides of the table, reviews the key policy issues which arise for the public sector in considering whether to adopt the PPP procurement route, and the specific application of this policy approach in PPP contracts, comparing international practices in this respect. It offers a systematic and integrated approach to financing PPPs within this public-policy framework, and explains the project-finance techniques used for this purpose. 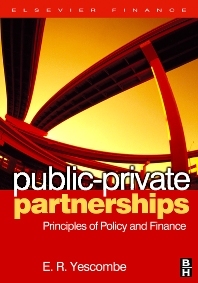 The book deals with both the Concession and PFI models of PPP, and provides a structured introduction for those who are new to the subject, whether in the academic, public-sector, investment, finance or contracting fields, as well as an aide memoire for those developing PPP policies or negotiating PPPs. The key issues in negotiating a project-finance debt facility. In addition the book includes an extensive glossary, as well as cross-referencing. PPP and project financing specialists and consultants, public sector officials developing PPPs, private sector investors in PPP projects, MBA students studying project finance, other professionals involved in PPPs: construction and maintenance contractors, lawyers, accountants, engineers, transport economists. Chapter 8 Project Finance and PPPs Introduction Development of Project Finance Features of Project Finance The Project-Finance Market Why Use Project Finance for PPPs? E.R. Yescombe is an independent consultant on project finance and public-private partnerships (PPPs), advising investors on financing for power, infrastructure and PPP projects, as well as public-sector entities on PPP policy issues, project procurement and contracting.